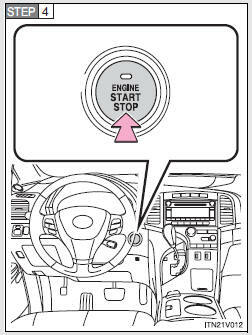 Performing the following operations when carrying the electronic key on your person starts the engine or changes “ENGINE START STOP” switch modes. The “ENGINE START STOP” switch indicator turns green. Press the “ENGINE START STOP” switch. The engine can be started from any “ENGINE START STOP” switch mode. Continue depressing the brake pedal until the engine is completely started. The engine will crank until it starts or for up to 30 seconds, whichever is less. Emergency flashers can be used. Some electrical components such as the audio system can be used. The “ENGINE START STOP” switch indicator turns amber. *: If the shift lever is in a position other than “P” when turning off the engine, the “ENGINE START STOP” switch will be turned to ACCESSORY mode, not to OFF. The green indicator light on the “ENGINE START STOP” switch will flash and a message will be shown on the multi-information display (TFT type only). 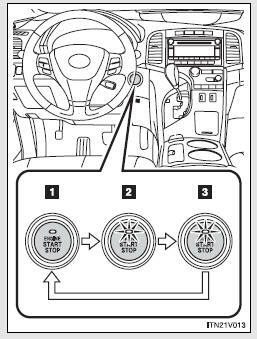 To free it, press the “ENGINE START STOP” switch while turning the steering wheel slightly in either direction. The engine immobilizer system may not have been deactivated. Contact your Toyota dealer. The system may be malfunctioning. Have the vehicle inspected by your Toyota dealer immediately. If the vehicle is left in ACCESSORY or IGNITION ON mode (engine is not running) for more than an hour with the shift lever in “P”, the “ENGINE START STOP” switch will automatically turn off. If you want to stop the engine in an emergency while driving the vehicle, press and hold the “ENGINE START STOP” switch for more than 2 seconds, or press it briefly 3 times or more in succession. However, do not touch the “ENGINE START STOP” switch while driving except in an emergency. Turning the engine off while driving will not cause loss of steering or braking control, but the power assist to these systems will be lost. This will make it more difficult to steer and brake, so you should pull over and stop the vehicle as soon as it is safe to do so. Do not leave the “ENGINE START STOP” switch in ACCESSORY or IGNITION ON mode for long periods without the engine running. • Do not race a cold engine. • If the engine becomes difficult to start or stalls frequently, have your vehicle checked by your Toyota dealer immediately.